Well fans have waited over 40 years, and now the dream has come true, and you can control the TARDIS, and jump-start it on its flight through space and time, however not every ride goes smoothly, and a laid back journey in the TARDIS was never going to happen, so it’s no surprise that within 5 minutes of playing the latest episode of Doctor Who: The Adventure Games the Doctor is sucked into a time vortex. The third episode in the season, helps to tide Doctor Who fans over whilst they wait for Series 6 to begin, and fans will not be disappointed, you may not be discovering a new exotic cityscape, or engaging in an old enemy of the Doctor, but you’re in the TARDIS, and you can walk around as much as you wish. 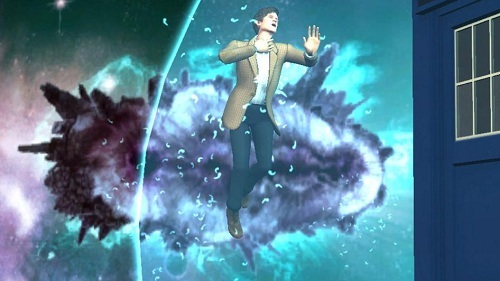 Fans of Amy Pond will be pleased to find that she is rather integral to the story, and saves the doctor for once, however unfortunately as usual she causes a lot of trouble when she lets ‘the entity’ loose on the TARDIS, however without companions the Doctor would have far fewer interesting adventures. In an attempt to save the Doctor we (Amy) are invited into the Doctor’s Drawing Room, a tidy little room full of trinkets and keepsakes from the Doctor’s adventures, littered with facts mostly relating to the last three Doctors, but also very interesting to explore. Of course one thing Amy doesn't know is that hidden in the room is an extremely safeguarded prison for one very dangerous detainee, that would remove the Doctor from the face of the universe if it had the chance, not before long you'll get to meet this criminal. The episode includes some nice puzzles, varied from the ones that we are used, not to mention the chance to prove your Doctor Who trivia in a small quiz that Amy must succeed in, in order to prove that she is who she claims to be. 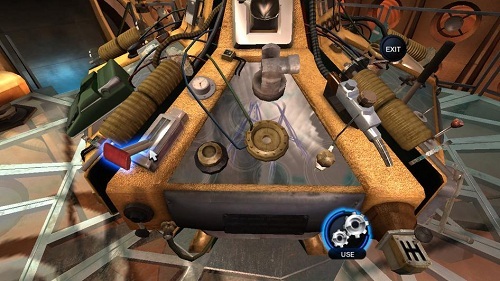 Of course you’re all wanting to know about controlling the TARDIS, well it may not be exactly as you expect, however when the feature was announced for the episode it was rather difficult to know what to expect, especially considering that we are playing an adventure game, so it was pleasantly surprising when the control of the TARDIS turned into a mind puzzle of sorts. The only problem with the episode is that you are rather limited in your exploration of the TARDIS because it contains a Lost Woods characteristic, and you are only given the main room and the drawing room to explore, you'll find that every other avenue takes you back to the main room, with the excuse that the Doctor really has to fix something with the TARDIS. It’s just a shame we didn’t see any of the far-stretching corridors that have been mentioned in the past. An episode like TARDIS will never please all fans, however the episode is a great change from running around locations, and the option of walking around the TARDIS, alongside getting up close and personal with the different control panels makes this episode a must for anyone that loves Doctor Who.